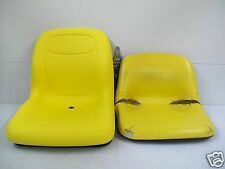 UP FOR SALE, A JOHN DEERE YELLOW SEAT 240 260 265 285 325 335 345 (Early 345) AM12366 NEW AFTER MARKET BOXES ARE A LITTLE WEATHERED ALLS EATS ARE STILL IN PLASTIC. This is a new seat with seat switch, part numbers AM144591 and AM125824. They fit John Deere 240, 245, 260, 265, 285, 320, F510 with optional high back seat, F525, SX85, 325, 335, and 345 tractors. It also fits John Deere 425 tractors with serial numbers below 070000. YOU ARE LOOKING AT THE SEAT MOUNT OFF A 1999 JOHN DEERE 325 IT IS IN GOOD USED WORKING CONDITION. FULLY FUNCTIONAL MOWER. JOHN DEERE 325 MOO325D070143. SEAT SPRINGS X 2. All references to the OEM are for identification purposes only. One-Year Manufacturer’s Warranty on all Products. We do need proof of installation with receipt for warranty purposes. IN the next month I will be parting out a Deere 425 AWS. It had a 54" deck and a blown motor, and broken side panels and hood. CX Gator (Serial Number 40000 & Up), Diesel Gator (Serial Number 22987 & Up), E, TE, TH, Trail HPX, TX Gator, TX (Turf), 4x2 4x4 4x6. NEW (5/16" UNC-18 OR 3/8" UNC-16) BOLTS WILL BE REQUIRED (NOT INCLUDED) TO MOUNT SEAT---- DO NOT REUSE ORIGINAL BOLTS! SKU: AM131531. Style: AM131531. Part: AM131531. MPN: AM131531. 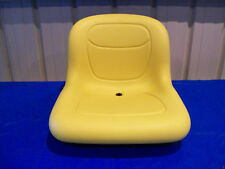 NEW in box Seat for John Deere lawn and garden tractors, part # AM131531. This is a high back seat with plastic base and twist in switch opening. SKU: AM131801. Style: AM131801. Part: AM131801. MPN: AM131801. 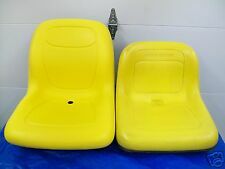 New in Box, seat that fits John Deere 325, 335, 345, with serial numbers above 070001, 355D, GT225, GT235, GT235E, GT345, GX255, GX325, GX335, GX345, GX355,LX255, LX266, LX277, LX279, LX280, LX288, and LX289 tractors. GX345 seat base and adjuster tracks. Good shape. No pad. Replaces Part Numbers: AM123666, AM103153, AM103189, AM107972, AM108654. Fits Model : GX255 GX325 GX335 GX345 GX355. Kumar Bros USA. is in no way affiliated with any OEM manufacturers. All OEM part numbers and logos are used for identification purposes only. 100% Money Back. For sale is a seat mount sliding adjustor off a John Deere 345. (Only applies for the continental states). 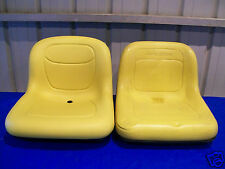 Replaces John Deere Mower Models New Yellow High Back Seat. Available in Yellow, Black, Camo, or Grey Vinyl. 19" high-back seat which will replace both original 16" and 19" high-back seats. Central drain hole prevents water build-up. This is a High Back Seat Kit, part number AM141482. It fits model GT225, GT235, GT245, GT255, LX255, LX266, LX277, LX279, LX280, LX288, LX289, GX325, GX335, GX345, GX355, SST16, SST18, 3203, X300, X304, X304R, X310, X320, X324, X340, X360, X465, X475, X500, X520, X530 and X700 tractors. 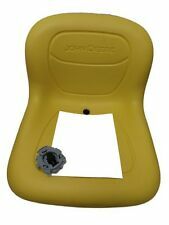 HERES A SEAT BASE OFF A JOHN DEERE 260 RIDING MOWER IT FITS OTHER MODELS.